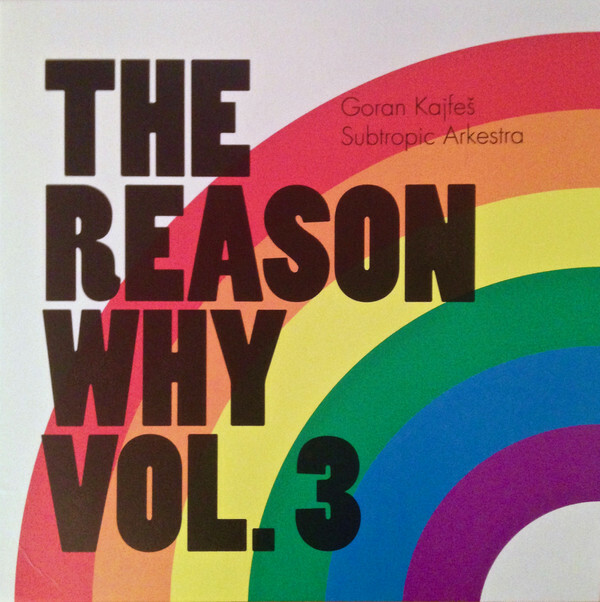 Goran Kajfeš Subtropic Arkestra-The Reason Why Volume 3. Just over four-and-a-half years ago, Swedish trumpeter Goran Kajfeš released the first volume in The Reason Why trilogy, on Headspin Recordings the label he had founded with producer David Osterberg in 2004. The Reason Why Volume 1 was hailed by critics as an ambitious and groundbreaking album, and was later nominated for a Grammis, the Swedish equivalent of a Grammy Award. This came as no surprise to those who had heard The Reason Why Volume 1, and felt that Goran Kajfeš would’ve been a fitting beneficiary of such a prestigious award. After all, Goran Kajfeš had been one of the leading lights of Swedish music scene for three decades, and had divided his time between touring and recording albums with various groups he was a member of, and solo albums. Just under two years later, in March 2015, the Goran Kajfeš Subtropic Arkestra returned with the eagerly awaited The Reason Why Volume 2. The second instalment in this trilogy of albums featured an all-star cast that included some of Goran Kajfes’ musical friends. They all played their part in the sound and success of The Reason Why Volume 2, which received the same critical acclaim as its predecessor. This meant that the Goran Kajfeš Subtropic Arkestra had just one further volume of The Reason Why trilogy to release. Now after two years and eight months later, the Goran Kajfeš Subtropic Arkestra make a welcome return with the third and final instalment in the trilogy The Reason Why Volume 3 which was recently released by Headspin Recordings. It marks the end of another chapter in the career of bandleader, composer, musician and producer Goran Kajfeš. He was born in Tyresö, in Stockholm County in east central Sweden on the ’22nd’ of June 1970, into a musical family. Goran Kajfeš father was Davor Kajfeš, the renowned Croatian pianist and composer. His musical talent would rub off on Goran Kajfeš, who growing up, learnt to play the trumpet among a variety of other instruments. Goran Kajfeš was already budding multi-instrumentalist, and would put his versatility to use later in his musical career. This included in the various bands that Goran Kajfeš founded and joined. One of the earliest groups Goran Kajfeš was a member of was Regis, in the late-nineties. However, as a new decade dawned, Goran Kajfeš became part of several bands. Among the various groups was the jazz band Oddjob who have released nine albums between 2002 and 2017. Goran Kajfeš found the time to join improv band Nacka Forum who released three albums between 2002 and 2012. It was just one of several groups he joined, who played everything from jazz and reggae to ska and soul. One of these bands was The Solution, who raison d’être was to replicate the sound of sixties soul. The Solution released two albums, 2004s Communicate and 2007s Will Not Be Televised, and became a popular live draw. During this period, Goran Kajfeš was a member of the Swedish ska and reggae band Club Killers, who released two albums between 2005 and 2008. They were also he house band at the Stockholm club, Club Killers. A year later, and Goran Kajfeš was a member of the Rocking Babooshkas when they released their album Демоны Любви in 2009. By then, Goran Kajfeš had joined The Moon Ray Quintet who released two albums between 2009 and 2010. After this, Goran Kajfeš was part of the Fire! Orchestra, and improv group Angles 8 when they released their album By Way Of Deception in 2012. However, Angles 8 was short-lived and Angles 9 was born in 2013. They’ve released three albums between ambitious albums of improv between 2013 and 2017. Remarkably, while working with all these bands, Goran Kajfeš was working with a variety of different artists in the studio and live. This included Magnus Carlson, Fläsk Quartet, Stina Nordenstam, Eagle-Eye Cherry, Håkan Hellström, José González, Eric Gadd, Janet Jackson, Stephen Simmonds, and The Thing XL. Still, though, Goran Kajfeš had found time to embark upon a solo career. Goran Kajfes’ debut album Solodebuten Home was released to critical acclaim in 2000, and was an innovative fusion of jazz and electronics. Four years later, and Goran Kajfeš returned with his long-awaited sophomore album Headspin. It was released to plaudits and praise in 2004, and won a Grammis, the Swedish equivalent of a Grammy Award. For Goran Kajfeš this was a huge honour, and gave his solo career a boost. Despite winning his first Grammis, it was six years before Goran Kajfeš returned with his third album X/Y in 2010. Critics sung X/Y’s praise upon its release, and it some critics and the album won the prestigious Nordic Music Prize. For Goran Kajfeš all his hard work was over the past two decades was starting to pay off. In April 2013, Goran Kajfeš returned with his latest project, the Goran Kajfeš Subtropic Arkestra who released The Reason Why Volume 1. It was the first in a trilogy of albums that the Goran Kajfeš Subtropic Arkestra were about to release. Critics upon hearing The Reason Why Volume 1 called the album ambitious and groundbreaking. It was no surprise when it was later nominated for a Grammis, the Swedish equivalent of a Grammy Award. Sadly, The Reason Why Volume 1 didn’t follow in the footsteps of X/Y. 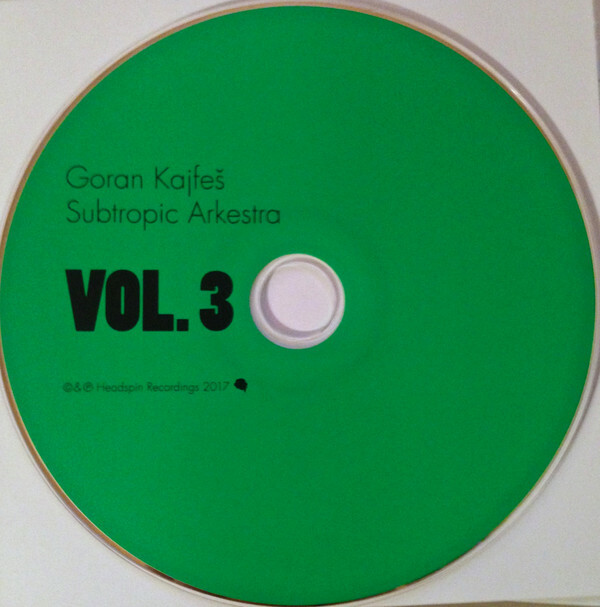 Just under two years later, in March 2015, and the Goran Kajfeš Subtropic Arkestra returned with The Reason Why Volume 2. The second instalment in this trilogy of albums featured an all-star cast that included some of Goran Kajfes’ musical friends. They all played their part in the sound and success of The Reason Why Volume 2, which received the same critical acclaim as its predecessor. This meant that the Goran Kajfeš Subtropic Arkestra had just one further volume of The Reason Why trilogy to release. The latest all-star lineup of Goran Kajfeš Subtropic Arkestra released The Reason Why Volume 2 in November 2017, and this brought to an end one the most hotly anticipated trilogies of recent years. As soon as each instalment hit the shelves of record shops, critics and music fans were eagerly awaiting the next volume. The one question on many people’s lips is this really the end of the released The Reason Why series? Goran Kajfeš has always been clear that The Reason Why was a trilogy, and that there would be no other volumes after that. It’s not a case that the cupboard is bare, and there’s no more music to release. Instead, Goran Kajfeš explains that: “when we came up with idea of performing interpretations of the music that inspires us, we decided to limit the project to three volumes to avoid being pigeonholed as a covers band. It has been an incredibly rewarding experience for the group’s sound and development, but now it’s time to look forward and see what’s next for the Subtropic Arkestra.” At least music lovers can sleep soundly knowing that there’s a future for the Goran Kajfeš Subtropic Arkestra. What direction the Goran Kajfeš Subtropic Arkestra will head in the future is for their founder to decide. “This is exciting because none of us knows what’s in there,” says Goran Kajfeš as he plots the next musical move in a career that began nearly back in the late-eighties. Since then, Goran Kajfeš has been one of the hardest working men in Swedish music, playing with various bands, and some of the biggest names in music. This has taken Goran Kajfeš around the world several times, and he’s taken to the stage in North America, South America, Japan, Europe and Britain. Still he finds time to record albums of innovative music, including The Reason Why Volume 3. For the final instalment in the trilogy, the Goran Kajfeš Subtropic Arkestra have chosen seven tracks that mean something to them. This included Hailu Mergia and The Walias’ Ibakish Tarekigne; Christer Bothén’s Trance Dance; Bernard Fevre’s Le Monde Avait 5 Ans; US 69’s I’m On My Way/Patch Of Blue;he Orchestre Poly-Rythmo de Cotonou’s Ne Rien Voir, Dire, Entendre; Noah Lennox a.k.a. Panda Bear’s You Can Count On Me and Caribou’s Sandy. These seven tracks became The Reason Why Volume 3, which was recorded by the Goran Kajfeš Subtropic Arkestra. Recording of The Reason Why Volume 3 took place at Svenska Grammofonstudion, in Göteborg, Sweden. The rhythm section featured drummer and percussionist Johan Holmegard, bassist Johan Berthling and electric guitarists Robert Östlund and Reine Fiske who also played mellotron. Jesper Nordenström switched between organ, Fender Rhodes, piano and synths, while percussionist Juan Romero made a guest appearance on Ne Rien Voir, Dire, Entendre. Joining trumpeter Goran Kajfeš in the horn section were saxophonist and flautists Per “Ruskträsk” Johansson and Jonas Kullhammar, while Per “Texas” Johansson played saxophone, clarinet and oboe. This was the lineup of the Goran Kajfeš Subtropic Arkestra that played on The Reason Why Volume 3. Opening The Reason Why Volume 3 is Ibakish Tarekigne, which was penned by Ethiopian keyboardist Hailu Mergia and The Walias. There’s more than a nod to the original, as guitars chime and combine with the rhythm section. Soon, growling horns enter, before a drum roll signals the chirping and weeping guitars. Later, a rasping, braying horn takes centre-stage as the rest of the Arkestra provide a sweeping, swaying accompaniment. This continues when the horns unite, before a weeping, shimmering guitar and rolls of drums interject. Mostly, it’s the four horns that take centre-stage, whether playing together or when Goran Kajfeš unleashes a blazing solo that plays their part in this beautiful homage to Hailu Mergia and The Walias. It sets the bar high for the rest of The Reason Why Volume 3. Just subtle keyboard plays as Trance Dance before the volume increases and hissing hi-hats join a glistening guitar and bass, before the braying horns enter. They seem to be playing within themselves, as the track starts to take shape. Meanwhile, the bass prowls as a distant guitar shimmers and chimes, as blistering horn kick loose and join with the mellotron and drums that power the arrangement along. By now, the Arkestra is in full flight and it’s a joy to behold. Their playing is flawless, as horns growl, bray and blaze and the bass continues to prowl as the arrangement surrounds the listener. It’s an immersive experience as an array of sounds assail the listener and the Arkestra play with speed, fluidity and precision. By then, the arrangement has become hypnotic, as stabs of searing horns and effects laden keyboards interject. Later, a blistering guitar solo comes close to stealing the show, as a progressive organ wah-wahs and rolls of thunderous drums power this nine minute epic to its impressive crescendo. As the drums provide the heartbeat on Le Monde Avait 5 Ans, cascading and glistening keyboards set the scene for the subtle horns that add to this melodic cover of this Bernard Fevre composition. 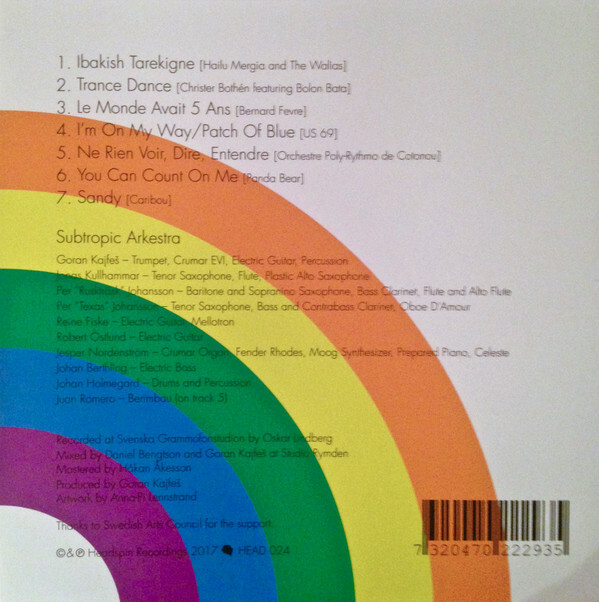 It’s played slowly, thoughtfully and with the utmost care, with each instrument, including the flute, electric piano, glistening guitar, synths, horns and rhythm section playing their part in what’s akin to a beautiful, melodic and melancholy musical tapestry woven by the Goran Kajfeš Subtropic Arkestra. It shows another side to this talented combo. Drums roll and rumble, horns bray, blaze and howl while a guitar is plucked and the bass is played with speed before a cymbal crashes on I´m On My Way/Patch Of Blue. That is the signal that it’s time for the Arkestra to get down to business. The rhythm section combine with the organ as a guitar rises above the rest of the arrangement and cymbals crash. Horns bray and blaze before the tempo drops, and the arrangement meanders melodically along, with the Arkestra showcasing their considerable skills. Especially a fleet-fingered guitar that weaves it way across the arrangement as horns growl and wail, before taking the track direction of free jazz. Later, a much more understated, mellow sound returns, as the chameleon-like Arkestra complete their ten minute musical adventure par excellence. Hissing hi-hats and drums are joined by horns on Ne Rien Voir, Dire, Entendre which was originally recorded by the Benin-based Orchestre Poly-Rythmo. Seamlessly, the Arkestra’s homage to the legendary orchestra takes shape. As the rhythm section provide the heartbeat, hypnotic chiming guitars provide a backdrop for the braying, blazing horns that are the Arkestra’s secret weapon. They play with speed, fluidity and invention. Then at the midway point a drum solo is accompanied by a searing, erects-laden guitar before the horns return and the arrangement rebuilds. When they drop out, the blistering guitar remains and washes of cascading mellotron are added while the rhythm section lock down the groove. In doing so, they play their part in what’s without doubt, one of The Reason Why Volume 3’s highlights. Closing The Reason Why Volume 3 is Sandy, which has a much more experimental sound as the arrangement meanders and drones, as sounds emerge from the arrangement. They’re not quite fully formed but can be identified, as subtle bursts of horns, a shimmering cymbal, a bass and keyboards emerge. However, the Arkestra is merely toying with the listener, and at 2.52 their cover of Sandy starts to take shape. The rhythm section provide a backdrop for the scorching, howling wailing horns while keyboards and percussion play their part as the Goran Kajfeš Subtropic Arkestra freewheel to the finishing line, where they bid their farewell to The Reason Why trilogy. This they do in style with an inventive, genre-melting track with a twist in the tale. While they’re traversing the universe, Goran Kajfeš Subtropic Arkestra will surely be looking for inspiration for their next album of genre-melting music. Sadly, it won’t be another instalment in The Reason Why series. Sadly, The Reason Why Volume 3 which was recently released by Headspin Recordings is the last in the trilogy. However, it’s another eclectic genre-melting album. This time around, the Goran Kajfeš Subtropic Arkestra combined elements of free jazz, fusion, jazz and rock with avant-garde, experimental and even African music on a couple of tracks, Ibakish Tarekigne and Ne Rien Voir, Dire, Entendre. These tracks see the multitalented Goran Kajfeš Subtropic Arkestra pay homage to Hailu Mergia and The Walias and the Orchestre Poly-Rythmo de Cotonou who are two of African music’s best kept secrets. Hopefully, this will encourage music fans to investigate the music of the bands from Ethiopia and Benin. These are just two of the seven tracks on The Reason Why Volume 3, which features a musical masterclass from the Goran Kajfeš Subtropic Arkestra. They’ve followed in the footsteps of musical luminaries like Tom Waits, David Bowie and Peter Gabriel, in releasing a trilogy of albums. While many trilogies are unintended or accidental, the Goran Kajfeš Subtropic Arkestra set out to release a trilogy of albums and have spent the last four years doing so. With each instalment in this critically acclaimed trilogy, the Goran Kajfeš Subtropic Arkestra have reached new heights and won new friends. However, the Goran Kajfeš Subtropic Arkestra have kept the best until last on The Reason Why Volume 3, which is another ambitious, innovative and flawless genre-melting opus which is a triumphant ending to this memorable trilogy.